My backpacking style and gear has evolved over the years. On the Appalachian Trail, I carried the Gregory Massif I used since age 16 and gradually shed weight. With the aging of my Jam and the demise of GoLite, I needed a new lightweight alternative. 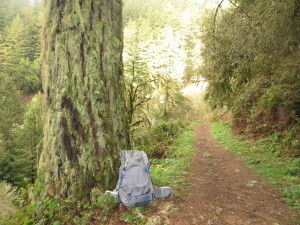 I purchased a GossamerGear (www.gossamergear.com) Mariposa after reading online reviews, following the GossamerGear blog, and hearing Gossamer TrailAmbassadors talk about the product. 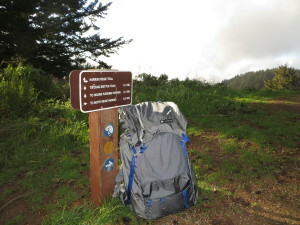 I packed the Mariposa with gear from my upcoming father/son backpacking trip and hiked a portion of the Bay Area Ridge Trail in my local Santa Cruz Mountains (Purisima Openspace Preserve). My first thought was why did I not make the switch sooner. The pack was light and spacious. The hip belt was luxurious, and the stability was welcome. It all provided a welcome contrast the the minimal hipbelt of the Jam. I am now a convert. Here are a few pictures from my test hike.